Doubletree Hotel LAX is a stunning retreat located in the heart of LA’s metropolitan El Segundo business district, and just 1.5 miles from LAX airport. With its lush, inviting estate, luxurious and comfortable rooms, and extensive amenities, the hotel is a standout among LA’s many lodging options and will keep you coming back time and time again. With its central location within lively El Segundo, the hotel makes an ideal destination for business travelers to check in and kick up their weary feet. Complimentary shuttle access to LAX, as well as the hotel’s proximity to major interstate highways, provides guests with the flexibility to make all of their appointments. For families and couples on vacation, the playgrounds and attractions of America’s largest West-Coast city are mere moments away. The Doubletree Hotel LAX features a range of 216 suites for every guest’s needs. Guest Rooms, available with one king-sized bed or two double-sized beds, are made with comfort in mind. The patented Sweet Dreams Bed technology relieves the exhaustion of a long day at work or play. Suites are available in luxurious trim, with two rooms and one king-sized Sweet Dreams bed. All Guest Rooms and Suites come furnished with a work desk, 27-inch LCD HDTV with Direct TV, complimentary WiFi, refrigerator, laptop safe, and adjustable thermostat. Large windows overlooking El Segundo and quaint, tasteful interiors provide an immediate breathing space from the busy city outside. An LA hotel wouldn’t be complete without a way to enjoy the sunshine, and the hotel delivers on that with a heated outdoor pool and hot tub. The fully-equipped PRECOR fitness center awaits those who want to stay fit during their travels. Relax in the hotel’s main lounge, or engage the services of its friendly and knowledgeable staff, who are more than happy to provide sightseeing tips to help you make the most of your stay. El Segundo is best-known as a business district that balances urban commerce with a small-town vibe, so there are plenty of opportunities for business travelers to both get things done and do it in style. Whether you want a quick meeting with a client at a coffee shop, or require the services of a fully-equipped golf course to soften your client up, the hotel situates you perfectly to achieve your goals. A full range of business center features is available from right inside your room. Families and couples on vacation benefit from the hotel’s location in a busy, but well-managed business district, giving them easy and painless access to major attractions like Hollywood Boulevard and Disneyland. Within a two-mile radius of the hotel, guests have access to the popular Venice Beach, as well as scuba diving, hiking trails, and boating. Travelers can end their day with a delicious meal at the East Grand Bar and Grille, with both outdoor and indoor seating options. The Doubletree Hotel LAX proves that you can mix both business and pleasure if you play your cards right. Located right next door to LA’s top commercial and entertainment venues, and featuring all the creature comforts you’d expect from top-quality lodgings, this hotel will ensure your time in LA is a memorable one. 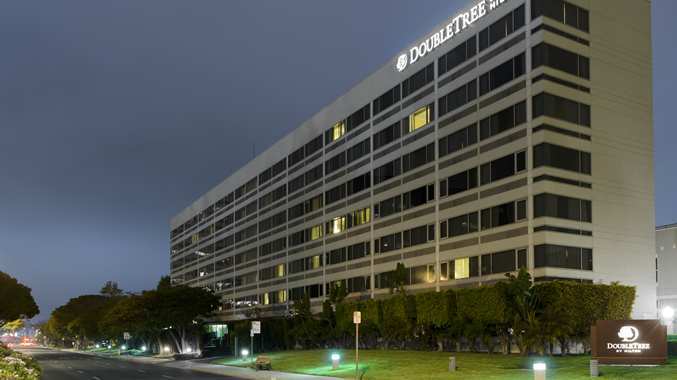 Doubletree Hotel LAX is a stunning retreat located in the heart of LA's metropolitan El Segundo business district, and just 1.5 miles from LAX airport.